With Valentine’s Day just a week away, I sat down with ABC-7’s Coleen Sullivan and Ellen Leyva with a Valentine’s Survival Guide to get you to and through the most romantic day of the year. Can you find love online in time for Valentine’s Day? I say yes! With the convenience of your mobile phone, we’ll have you chatting and dating in a digital split second. Sign up for a Mobile Dating App – Use your Facebook photos to create a new profile and say “love is in the air.” Have a friend or a dating coach like myself help you with your profile. Become a serial dater – This is the time I give you permission to date up a storm. Schedule one date a day until Valentine’s Day. Double-down and schedule two dates a day, where one will surely rise to the top and be worthy of a second date. Use Premium Features – Match shows you peak times, where their Top Spot feature will show your profile to get the most visibility for just a few hours. OkCupid’s Boost feature will do the same for 15 minutes. Give your date a card – A hand signed card or a love note will warm his or her heart for all dating stages. Don’t forget Flowers – Two billion dollars will be spent on Valentine’s Day flowers this year. Bring one long-stemmed rose or a dozen tulips to have the same effect, while not breaking the bank. Say ‘I Love You’ – If you’re relationship is moving forward, there’s no better time to profess your love than on Valentine’s Day. Choose In-Room Dining or Cook a Meal Together – If you’ve waited too long to make a reservation at his or her favorite place, pick up some prepared meals at the grocery store, or ingredients for a spicy romantic dinner. Remember to bring candles. The gift of time – Valentine’s Day is about spending quality time together, and there’s not better gift than just being together. Valentine’s Breakups – It’s not a great idea, but if your relationship has been sliding downhill since the past holiday season, have a talk with your significant other, sooner rather than later. Valentine’s Day can be filled with pressure, so be kind about it and if you’re going to call it quits, do so in person, and not on the phone, email, or in a text message. Singles Awareness Day is on February 15th – If you’re not in the mood to find a Valentine and hate the holiday, there’s no need to fret. The day after will be a holiday to celebrate your single status. Don’t let the pressure get to you about Valentine’s Day. Some people are still paying off their credit cards from December gift giving. A study shows that 54% plan to spend less than $100 and only 10% of singles spend over $250 on Valentine’s Day. A survey from OneHourTranslation.com of over 4000 people around the world, showed that 31% plan to purchase their gifts online this year, so there’s still time to send something romantic to your Valentine or digital crush. Julie Spira is America’s Top Online Dating Expert and Digital Matchmaker. 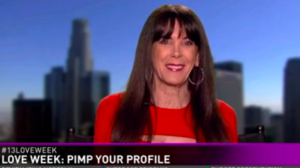 She’s the CEO of Cyber-Dating Expert and is an award-winning dating coach who’s been helping singles on finding love online for over 24 years. Dating Sunday, on January 6th, is the world’s largest digital love-fest. It’s also peak season for online dating, so get ready to join the party. Singles are putting love at the top of their New Year’s resolution list. More singles are joining the dating pool due to a pre and post-holiday break ups. The countdown clock to Valentine’s Day is ticking. 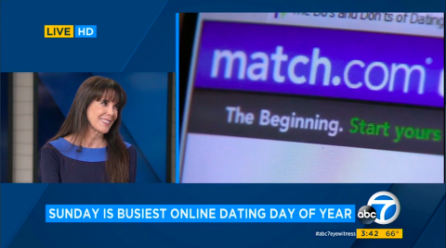 On ABC 7 Eyewitness News in Los Angeles, I spoke with Anabel Muñoz and John Gregory on why Match has proclaimed this Sunday as the most popular day of the year for online dating. What should you do to get ready for Dating Sunday? The days leading up to Dating Sunday are a reflective time for many who are thinking about finding a meaningful relationship. It’s also “peak season,” for online daters, which starts right after Christmas and goes through Valentine’s Day. It’s a time for new beginnings, so take new photos, update last year’s profile, and turn on your push notifications to make the most of this season. Dating Sunday, or #DatingSunday is the day dating sites see the greatest surge of users. Match been analyzing data since the site was launched in 1995 and predicts 9:05pm/ET, will be the busiest, with the most usage. The site reports a 69% spike in new singles joining on this day. During peak season, 50 million messages are expected to be sent during peak season, through Valentine’s Day, resulting in 1 million dates! It’s actually quite exciting to see singles become so positive about finding love online and joining mobile dating apps and sites at the start of the new year. Other sites, such as Plenty of Fish, expect over 117,000 new signups on Dating Sunday, peaking at 9pm. Remember, 1 in 3 relationships start online, so you’ll be in good company and we’re here to help you find love in 2019. Julie Spira is America’s Top Online Dating Expert and Digital Matchmaker. She’s the CEO of Cyber-Dating Expert, and as an early adopter of online dating, has been coaching singles on finding love online and on mobile dating apps for almost 25 years. Find out how our Irresistible Profiles will help you find your dream date. Bumble, the mobile dating app which gives the women the control to make the first digital move has become a favorite for men and women alike. 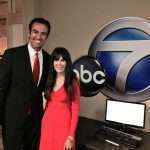 In a recent interview on ABC 7 News in Los Angeles, I spoke with reporter Elex Michaelson about what I call the Sadie Hawkins of digital dating. Watch the Video below by clicking the link. The best part of Bumble, is the women have 24 hours after a mutual match to initiate contact. After 24 hours, the match disappears, so this helps singles to stay engaged with the process if their goal is to change their relationship status. The reason men like Bumble, is they’re less likely to get rejected if the woman contacts them. For my dating coaching clients, they like this feature, as they often get tired of swiping right on other mobile apps such as Tinder, without every getting a match or a conversation started. 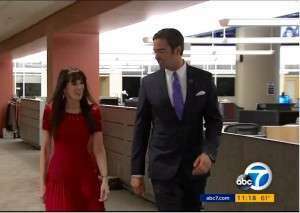 ABC 7 interviewed single dater Elana Feldman who said the men were 10 times more attractive on Bumble. Feldman is still looking for her match, so she says, she’ll keep swiping. We featured Bumble in the Cyber-Dating Expert 6 Best Mobile Dating Apps for 2016, along with Tinder, Hinge, Happn, Coffee Meets Bagel, and Tastebuds, so look a look at the list and try a few mobile dating apps to see which one will be your favorite. Julie Spira is America’s Top Online Dating and Mobile Dating Expert. She was an early adopter of the Internet and has been coaching singles on finding love online for over 20 years. Find out about Swiping Right programs for mobile dating and Irresistible Profiles programs for creating an online dating profile to capture his or her digital eye. Follow @JulieSpira on Twitter and Instagram and sign up for the free Weekly Flirt newsletter. It’s Valentine’s Week at at ABC in Norfolk VA, they’ve declared it #loveweek. It was an honor and joy to be interviewed by ABC’s 13 News Now on how to have the best online dating profile. Plus I shared a personal story from my book, The Perils of Cyber-Dating: Confessions of a Hopeful Romantic Looking for Love Online. Follow @JulieSpira on Twitter and sign up for our free Weekly Flirt newsletter filled with dating advice and delivered to your inbox. Julie Spira is America’s Top Online Dating Expert and Digital Matchmaker. She was an early adopter of the Internet and has been coaching singles on how to find love online for over 20 years. Julie’s a frequent guest in the media with her online dating and mobile dating advice. She ranks as the most influential person in dating and online dating on social media influence site, Klout. Listen to our audio book trailer for the newly revised bestseller, The Perils of Cyber-Dating: Confessions of a Hopeful Romantic Looking for Love Online, now available on Audible, Kindle, and Amazon. 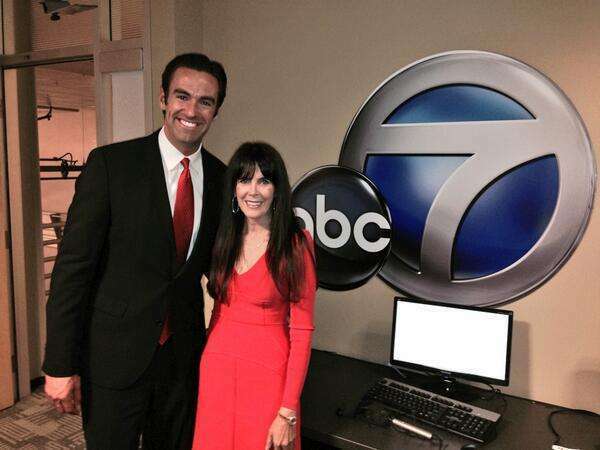 It was an honor and joy to be interviewed by Elex Michaelson of ABC-7 television in Los Angeles about the popularity of mobile dating apps. As Tinder continues to take the world by storm, the feature included an interview with Tinder’s co-founder, Justin Mateen, as well as featured other mobile dating apps including eHarmony, JDate, Match, OkCupid, Grouper, Grindr, and Coffee Meets Bagel. Mobile dating is now over a $200 million dollar industry. Are you wondering how it all works? Watch the video below for highlights. Julie Spira is an online dating expert and mobile dating expert who was an early adopter of Internet dating. She created her first profile almost 20 years ago and coaches singles on the dating scene with her Irresistible Profiles programs and her Mobile Dating BootCamps. For more dating advice, follow @JulieSpira on Twitter and sign up for the Free Weekly Flirt newsletter.